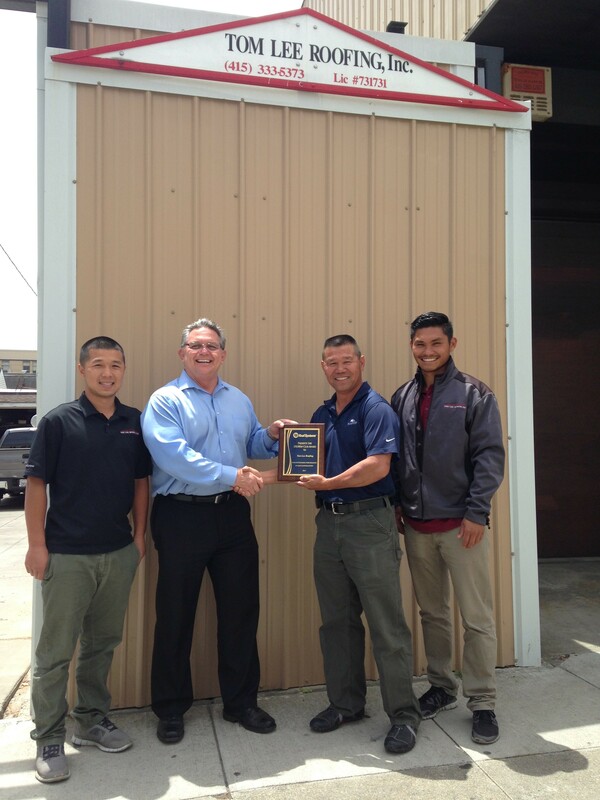 IB representative, Robert Cardenas, recognized Tom Lee Roofing for outstanding performance in sales and installation in 2014. Tom Lee Roofing Inc. adopts practices and policies that emphasize quality, efficiency, and exceptional customer service. Only the finest products and materials available on the market are used for any given project. We specialize at installing Modified Bitumen Membrane roofing systems for flat roofs and most types of roofing systems for pitched roofs (shingles, clay tiles, shake, slate, standing seam metal). Tom Lee Roofing, Inc. is a Certified Master Shingle Applicator of CertainTeed and a certified Gold Contractor of Polyglass, both of which are leading manufacturers of roofing systems and products. Furthermore, we are in full compliance with California’s Energy Efficiency Standards for residential and non-residential buildings (California Code of Regulation), or Title 24, Cool Roof Rating Council (CCRC). Tom Lee Roofing, Inc. is owned by brothers Tom and Howard Lee. The company employs over 40 highly trained and experienced roofers, many of whom have been with Tom Lee Roofing, Inc. since the company’s inception. Our roofers are able to quickly access a roofing or potential roofing issue and provide solutions. They are capable of correcting water ponding problems, replacing insufficient roof drains and installing custom made sheet metal flashings. We consider these well trained, meticulous, hardworking employees to be one of our most valuable assets. Our multi-lingual office staff is friendly, courteous and fluent in English, Cantonese, Mandarin and Spanish. We are committed to answer any roofing questions in an informative and knowledgeable manner. The estimators we employ are experts in roofing who can find the best solutions or alternatives to meet and exceed our customer’s highest expectations.